Discover multicultural Johannesburg, it's mixture of old and ultra-modern architecture. Get to know the wild side of South Africa as you embark on a game drive in the Kruger National Park. In Cape Town, visit the Cape of Good Hope, the penguins of Boulders Beach and discover towering Table Mountain. Finally, relax in Mauritius paradise on an All-Inclusive basis. International flights: US - Johannesburg, Mauritius - US. 8 Breakfasts, 2 Dinners & All Inclusive in Mauritius. All-Inclusive. We suggest visiting a traditional market to get a closer look at Mauritian culture. The best known are the markets of Port Louis or Quatre Bornes, where you can find a myriad of traditional dishes, vibrant colored textiles and spices. Alternatively, enjoy an optional tour of Mystic South. * Overnight in Mauritius. Breakfast at the hotel. Free time until the indicated time for the transfer to the airport. Embark on the flight back to the US. Night on board. 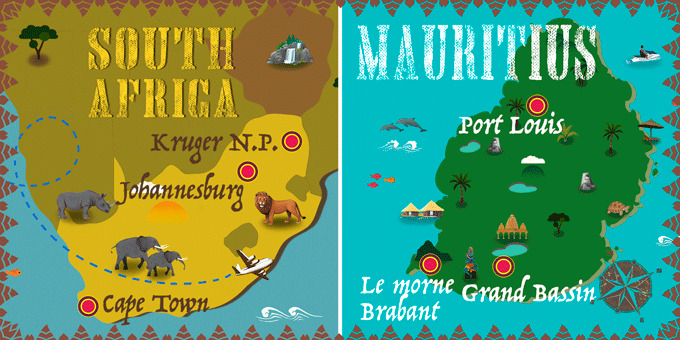 6 Breakfasts, Full-Board in Kruger & All Inclusive in Mauritius. Breakfast at the hotel. At the indicated time transfer to the airport to board a flight to Kruger, home to some of the most iconic wildlife in South Africa, transfer to the hotel, check-in and lunch. Dinner and overnight stay in Kruger. Breakfast at the hotel. At the indicated time transfer to the airport to board a flight back to Johannesburg. Free day to get to know the city, famous for its fantastic food and arts scene. Overnight stay in Johannesburg.